Here is my last swap card. Now maybe I should pack some clothes! Off to the Stampin’ Up! Convention leaving early tomorrow morning. I thought demos might like to look ahead at a fall project. The new Vintage Leaves set and matching framelits is great and you can get them as a bundle for 15% off. I used some new in colors (Delightful Dijon, Tip Top Taupe) with Cajun Craze and the new metallic thread as well. -Gorgeous Grunge stamp set adds some speckles and the sentiment is from Cottage Greetings. -The leaf is cut from the new Corrugated Paper. 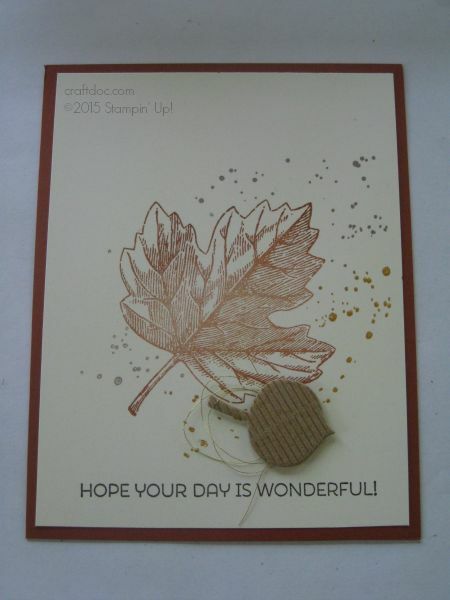 -I added a Stampin’ Dimensional to the back of the leaf and then circled the thread to attach. -All products can be purchased from my website SHOP.